Download, install and use immediately after purchase. 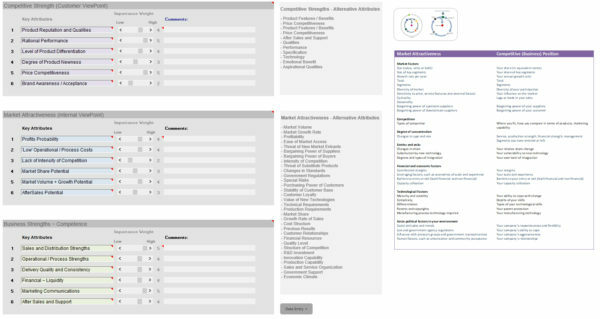 MFP – Multi-Factor Positioning. 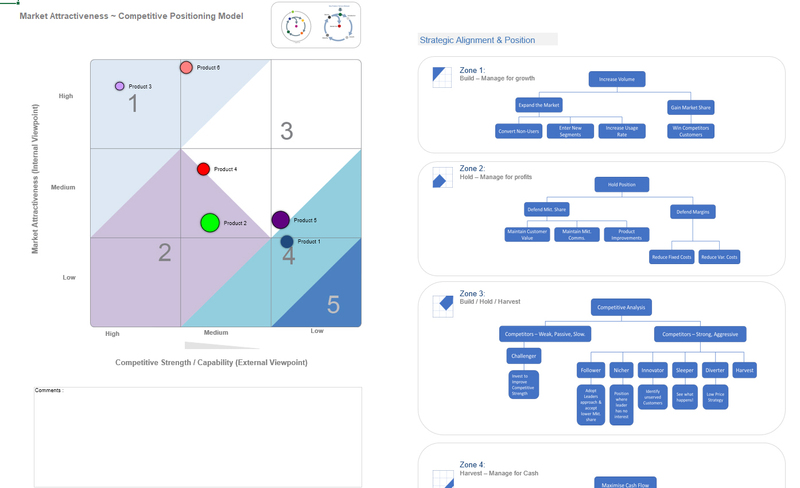 This comprehensive but easy to use model is used to determine a ‘products’ life-cycle position and is an essential purchase for anyone involved in a ‘strategic product management’ position. Up to 16 products (or product groups) from a portfolio can be analysed using this model. If you require additional products this can be achieved by running a separate file in parallel. In addition the MFP model can also be used to analyse up 16 market segments against a given product. 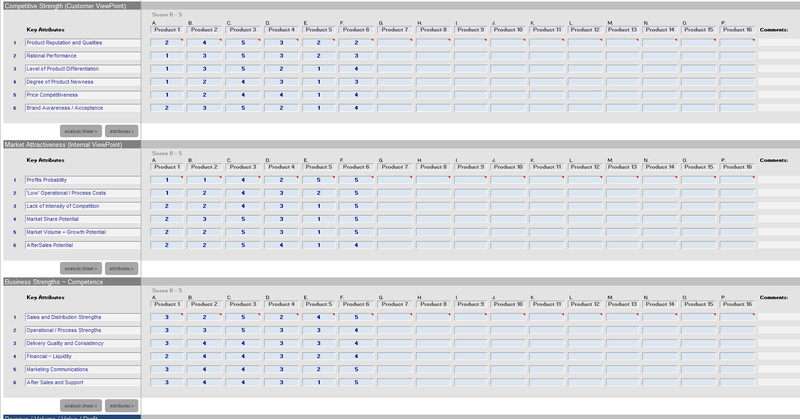 So once again the model can be run several times to cover different variations of situational analysis. 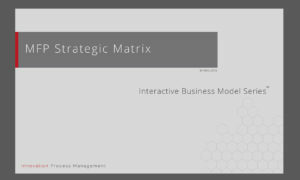 Included in this model and to complement the derived positioning from the analysis, are suggested ways forward / strategic possibilities. 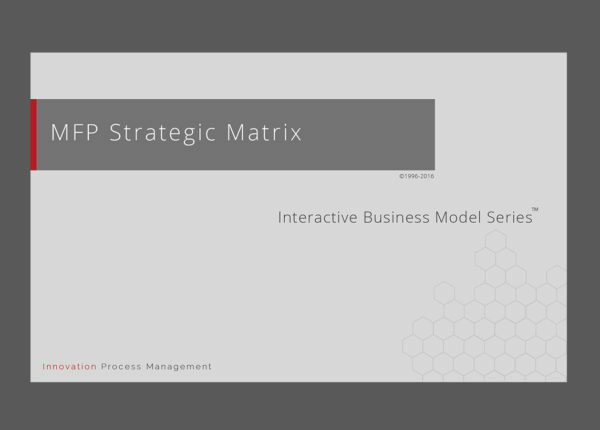 In common with all of our interactive business model series, this model can be populated by an individual and the ‘strategic rationale’ can be derived from that analysis and acted upon accordingly (this is very useful for determining the most sensitive attributes). 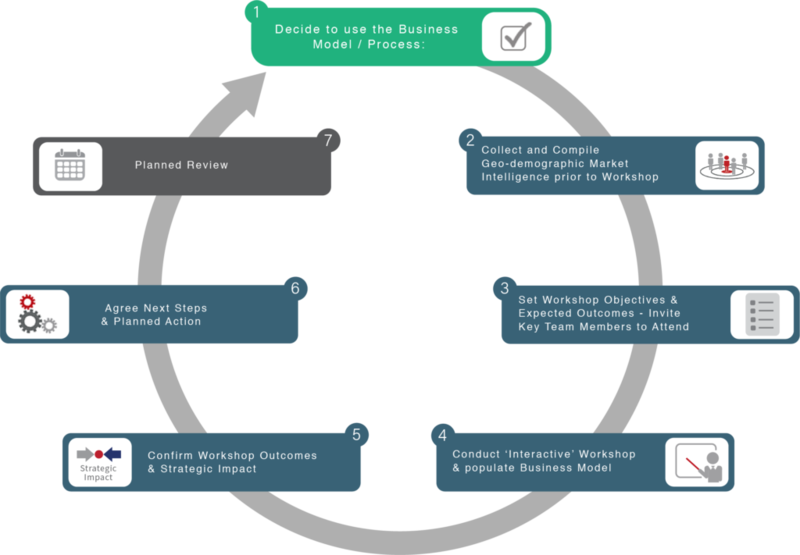 However, this model comes into its own when used within a team /workshop environment, as subjective elements are aligned and calibrated by the team. 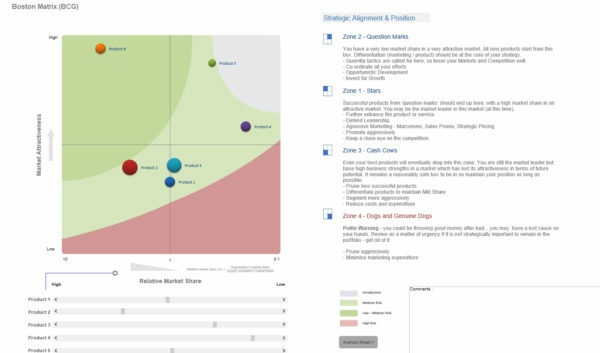 …everyone in that particular workshop aligns with the agreed situational positioning and the analysis that follows becomes more clear and aligned with strategic intent – very compelling indeed. 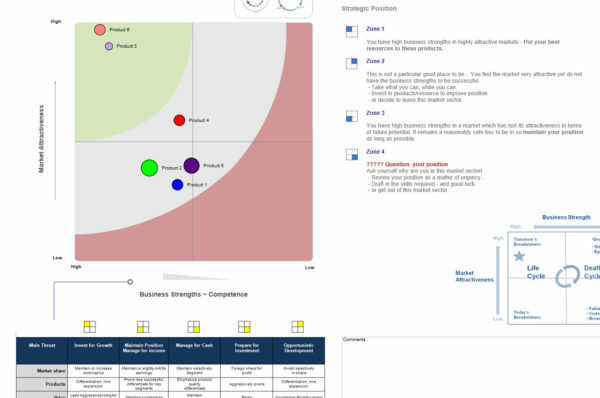 This model is an excellent tool to discuss the core aspects of Life-Cycle management. 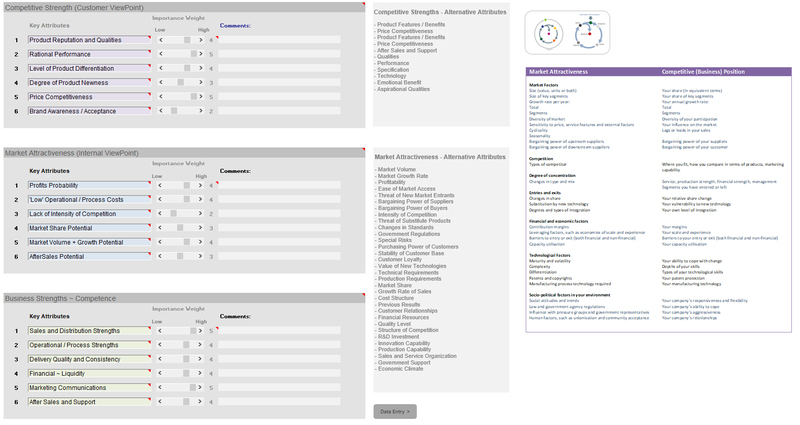 MFP – Multi-Factor Positioning. This comprehensive model is used to determine the ‘products’ life-cycle position and is an essential purchase for anyone involved in a ‘strategic product management’ position. This software is distributed as a standard WinZip file which contains a ‘.exe’ (executable) file format and requires a suitable Windows based operating system and ‘full’ version of Microsoft Excel (macro enabled) installed and operational on your PC / Mac. 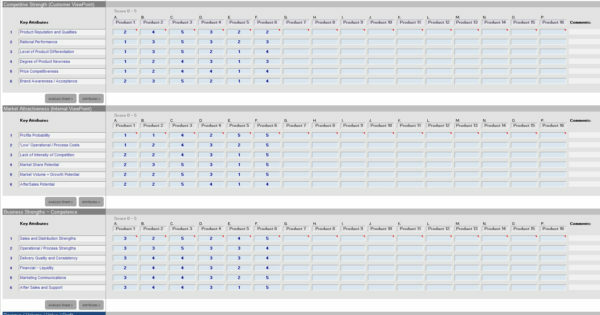 The application (interactive model) will run on 32-bit and 64-bit versions of MS windows and Excel (inc. office 365). This interactive model produces secure files that automatically run on MS Excel. The files produced include specific programming (VBA) which in turn has been thoroughly checked for the presence of any viruses /malware / malicious code by; Symantec Norton Antivirus. The distribution file for this software is a .exe file (executable) and includes an embedded ‘signed’ digital certificate for complete authenticity and integrity. Digital signing is based on Microsoft Authenticode technology and ensures that the software is completely genuine – If the software is not genuine or has been tampered with, the operating system and or antivirus program will trigger an appropriate message. Furthermore, after you install the programme, it will automatically become hardware locked to the computer it was installed upon and any files produced thereafter will once again be hardware locked. How to install the product after purchase – The following instructions will also be given as part of the order confirmation process. a) Download and install the program zip file using the secure URL Link. b) Unzip the file and install the .exe file – double click and follow on-screen instructions. c) Once the program has been installed, select it from your main program menu (under Arcturus7 Business Models) and follow the ‘on screen’ instructions. d) You will be prompted for an ‘Unlock Token’ the first time you run the program.